(Nanowerk News) A team led by DESY scientists has designed, fabricated and successfully tested a novel X-ray lens that produces sharper and brighter images of the nano world. The lens employs an innovative concept to redirect X-rays over a wide range of angles, making a high convergence power. The larger the convergence the smaller the details a microscope can resolve, but as is well known it is difficult to bend X-rays by large enough angles. By fabricating a nano-structure that acts like an artificial crystal it was possible to mimic a high refracting power. Although the fabrication needed to be controlled at the atomic level — which is comparable to the wavelength of X-rays — the DESY scientists achieved this precision over an unprecedented area, making for a large working-distance lens and bright images. Together with the improved resolution these are key ingredients to make a super X-ray microscope. 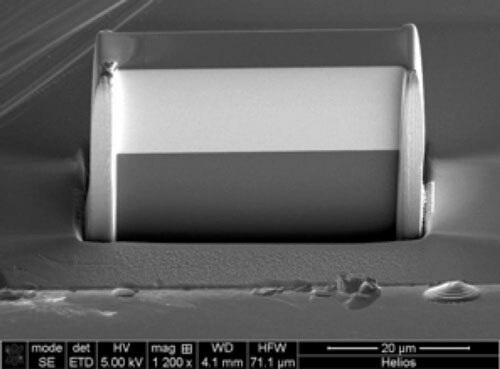 The team led by Dr. Saša Bajt from DESY presents the novel lens in the journal Scientific Reports ("High numerical aperture multilayer Laue lenses"). "X-rays are used to study the nano world, as they are able to show much finer details than visible light and their penetrating power allows you to see inside objects,” explains Bajt. The size of the smallest details that can be resolved depends on the wavelength of the radiation used. X-rays have very short wavelengths of only about 1 to 0.01 nanometres (nm), compared to 400 to 800 nm for visible light. A nanometre is a millionth of a millimetre. The high penetration of X-rays is favoured for three-dimensional tomographic imaging of objects such as biological cells, computer chips, and the nanomaterials involved in energy conversion or storage. But this also means that the X-rays pass straight through conventional lenses without being bent or focussed. One possible method to focus X-rays is to merely graze them from the surface of a mirror to nudge them towards a new direction. But such X-ray mirrors are limited in their convergence power and must be mechanically polished to high precision, making them extremely expensive. An alternative means to bend X-rays is to use crystals. A crystal lattice diffracts X-rays, as the German physicist Max von Laue discovered a century ago. Today, artificial crystals can be tailor-made to sharply focus X-rays by depositing different materials layer by layer. From this building block comes the multilayer Laue lens or MLL, made by coating a substrate with thin layers of the chosen substances. 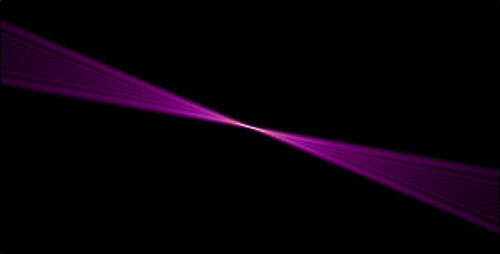 “However, conventional Laue lenses are limited in their converging power for geometric reasons,” explains Bajt. “To gain the maximum power, the layers of a MLL need to be slightly tilted against each other.” As theoretical calculations have shown, all layers of such a “wedged” MLL must lie perpendicular on a circle with a radius of twice the focal length. This rather specific condition could not be fabricated — until now. Bajt’s team invented a new production process, where a mask partially shields the substrate from the depositing material. In the half-shade of the mask a wedged structure builds up, and the tilt of the layers is controlled simply by adjusting the spacing of the mask to the substrate. The wedged MLL is then cut from the penumbra region. "Before us, no one came close to building such a wedged lens", says Bajt. The researchers manufactured a wedged lens from 5500 alternating layers of silicon carbide (SiC) and tungsten (W), varying in thickness. The final lens cut from these deposits was 40 micrometres (millionths of a metre) wide, 17.5 micrometres thick and 6.5 micrometres deep. The team tested their novel lens at DESY's ultra brilliant X-ray source PETRA III. The test at the experimental station P11 showed that the lens produced a focus just 8 nm wide, which is close to the design value of 6 nm. The tests also showed that the intensity profile across the lens is very uniform, a prerequisite for high quality images. The lens design allows to transmit up to 60 per cent of the incoming X-rays to the sample. The scientists focussed the X-ray beam in just one direction, resulting in a thin line. Focussing in two dimensions to obtain a small spot can be done by simply using two lenses in line, one focusing horizontally and the other vertically. “Our results prove out our fabrication technique to achieve lenses of high focussing power. We believe we have the requisite control to achieve even higher power lenses,” elaborates Bajt. “It appears that the long-sought goal of focusing X-rays to a nanometre is in reach.” This will put X-ray imaging on par with the quality achieved with scanning electron microscopes, that typically have a resolution of 4 nm. The advantage is that X-ray imaging is not limited to viewing surfaces or extremely thin samples only, but can penetrate a sample. “Our novel lens concept will help scientists to peer deeper into the nanocosm and make previously inaccessible details visible,” says Bajt.